That's crazy, it looks like the UPS is more like a square wave almost...for sure a modified sine wave, those always scare me. 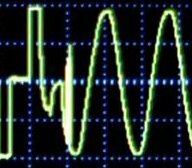 I like pure sine wave, just so much simpler and nothing to worry about. I wonder if a pure sine wave UPS syncs really well before it switches over? The pure sine wave inverters seem to be dropping in price, but the modified sine waves are dropping too. They are good for some things, like powering a PC directly. 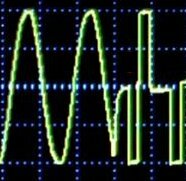 The switching power supplies in a PC or laptop don't seem to care, even if you throw a square wave at them. Some newer and more expensive PC power supplies with power factor correction built in may have problems with modified sine waves, haven't seen any test data anywhere yet. Pure sine is the way to go if you can afford it! Pic 1 shows a typical Modified Sine Wave (MSW) pattern, which is the output of most small UPSs sold today. Pic 2 shows how it can switch on the negative transition too. And what looks like a program glitch causes the negative MSW pulse to shift over to the right, probably due to it taking time to switch the relay or something. Pic 3 shows how it switched at the top of the grid waveform, but the MSW was already dropping, so you see a slight glitch. This also shows some syncing to the grid, we could be seeing a negative MSW here instead at that point, but we don't so it seems to keep in sync for +/-. Pic 4 shows you how crazy it can get. The MSW is just about in sync, but it's at it's zero crossing when it switches, so it pulls down the AC but then what I see as a programming glitch in the MSW routine, it pulses up a little late, forgets the zero crossing part of that cycle, and then continues on as normal. Very messy. About the same as pic 2, but on the positive side. Pic 5 shows again how it is synced but since the MSW is down at it's zero crossing, it pulls down the grid side a little and causes a glitch.